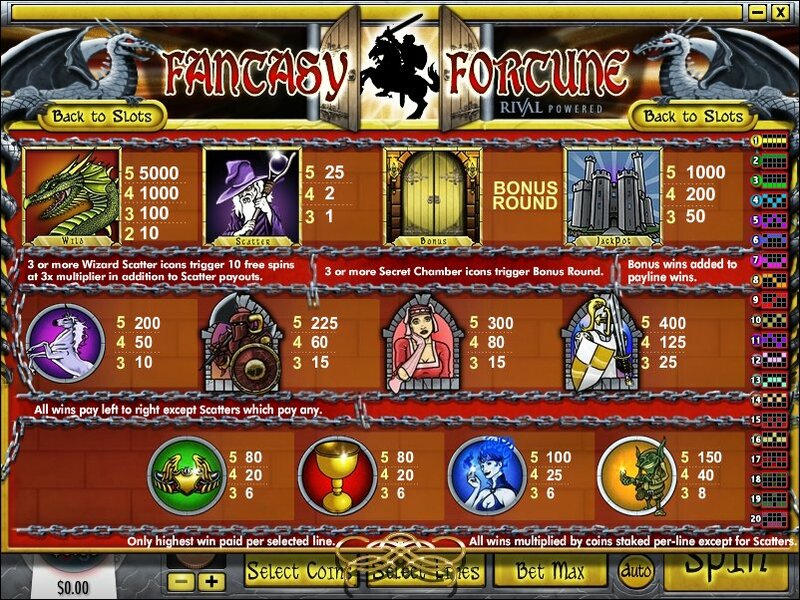 Overview: Fantasy Fortune is a 5 reel, 20 payline, 10 coin Slot game. Fantasy Fortune has one wild icon, 2 scatter icons and 1 bonus round. The Wizard Scatter Icon is a Scatter Icon. If 3 of these icons appear on the Reels you will receive 10 free spins. The free spins will be worth the same value per spin as the original spin that triggered the free spins. Any wins received during these free spins will payout at 3X the payout listed on the paytable! The Bonus Doors Icon is a scatter icon which will trigger the Fantasy Fortune bonus round. If 3 of these icons appear on the reels you will be sent to the Fantasy Fortune Bonus Round. These symbols do not need to appear in a sequence to trigger the bonus round as well you do not need to be playing all Paylines. It can be anywhere on any of the five reels. 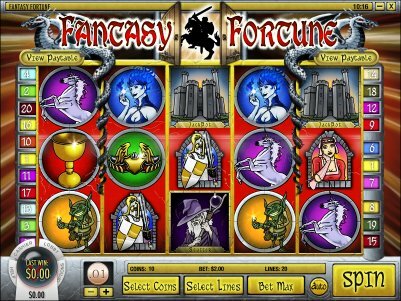 Similar Slots: If you like Fantasy Fortune, you might like these other Rival video slot machines: All Aboard, Jolly Roger's Jackpot, Moonshiners Moolah, Pigskin Payout, Silver Unicorn, Zombiezee Money.